We all have visceral instincts about others. Without literally smelling him, my senses and sensibilities signal that Cardinal George Pell, that erstwhile defender of the indefensible in the Catholic Church is a corrupt individual of the lowest (or highest?) order. He seems thoroughly untrustworthy, and certainly willing to suborn, dare I say pell-mell, a recent witness to the Royal Commission into Child Abuse, who was allegedly abused as a child by a Catholic priest under Pell’s protection. David Shoebridge, Greens MP in NSW Parliament, is trying again to introduce legislation to allow victims to sue the Church for damages. At present the so-called Ellis Defence protects the Church, which is deemed to be an unincorporated association with its assets held in unrelated trusts. John Ellis failed in the High Court to overturn this outrageous rort, where the Church effectively does not exist as a legal entity with attendant responsibilities. Which is probably appropriate for an organisation dealing in the occult, but let’s them off the hook for all their gross wrongdoings. The Church is also exempt from any form of taxation in Australia, which is handy for a wealthy fraternity (brotherhood indeed!) dedicated to serving, oh hallelujah, the poorest and disadvantaged of our abundant society, as did Jesus apparently. 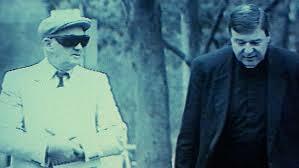 Pell should be brought back from his Rome sinecure to face the Royal Commission, and finally be put under forensic legal scrutiny with serious consequences, and not just brush off any criticism as before. More power to Shoebridge, and may justice be done one day! I Agee. Can’t stand Pell and the legal position of the church is criminal.